Two new light commercial Vaillant 656 boilers. Utilising the lasted Vaillant control ebus connections ensuring both boilers are can be utilised to suite heating demand or one at a time. The controller also ensures that each boiler get exactly the same amount of hours use. Both boilers are plumbed through a low loss header. This maintains a constant flow rate through the boilers for smooth running and efficiency. Large system filter also installed to prevent any particles from the old central heating system entering and damaging the new boilers. 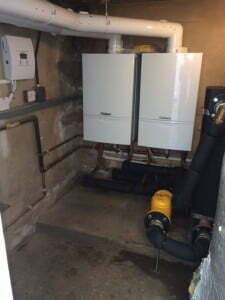 These two boilers replace one ageing boiler that was proving uneconomical and kept breaking down.